September in the garden always seems to bring out a welcome return for some of the roses and clematis that have bloomed in early summer, with less intense heat the flowers linger longer too. 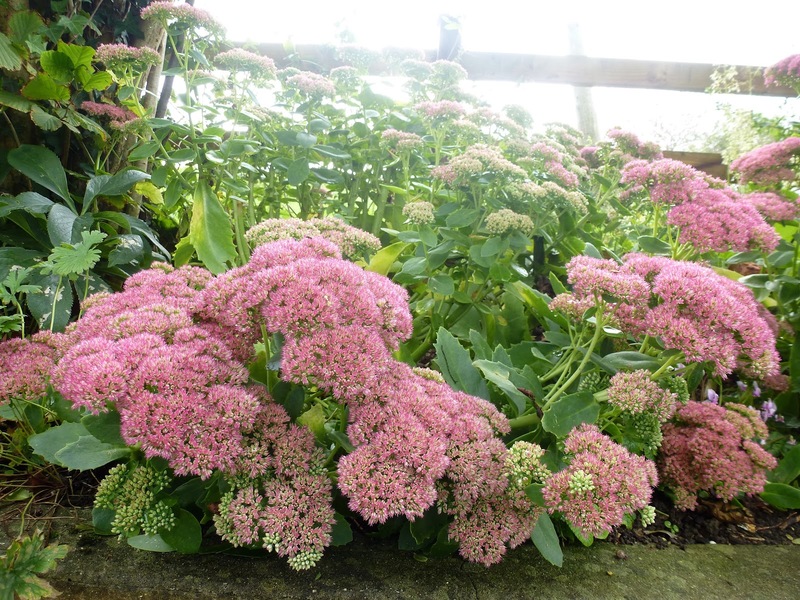 In contrast our border under the hazel bushes have an abundance of sedums that only flower at this time of year and provide an attraction to the butterflies. Another autumn flower is Gladiolus murielae, they have a wonderful scent. In the past I have found them impossible to grow. 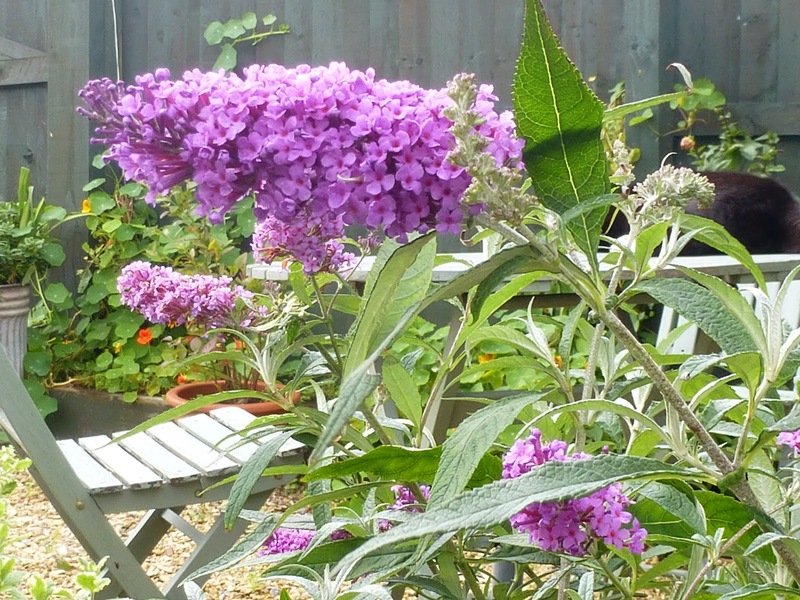 They seem to be happier growing in pots and this is the second season that they have flowered. 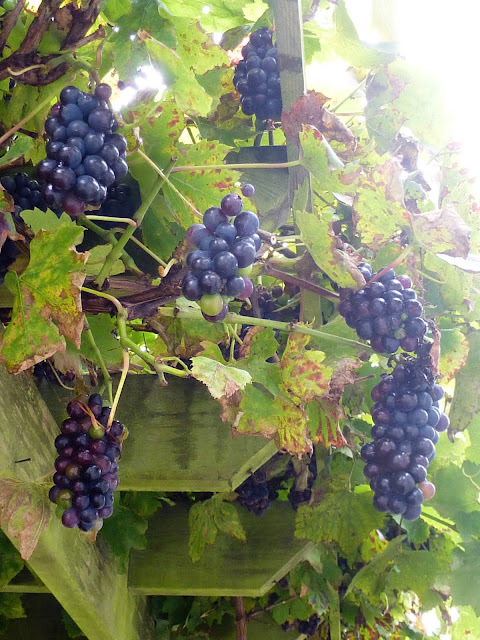 Our grape vine has a profusion of fruit and we are determined to try making some wine this year! 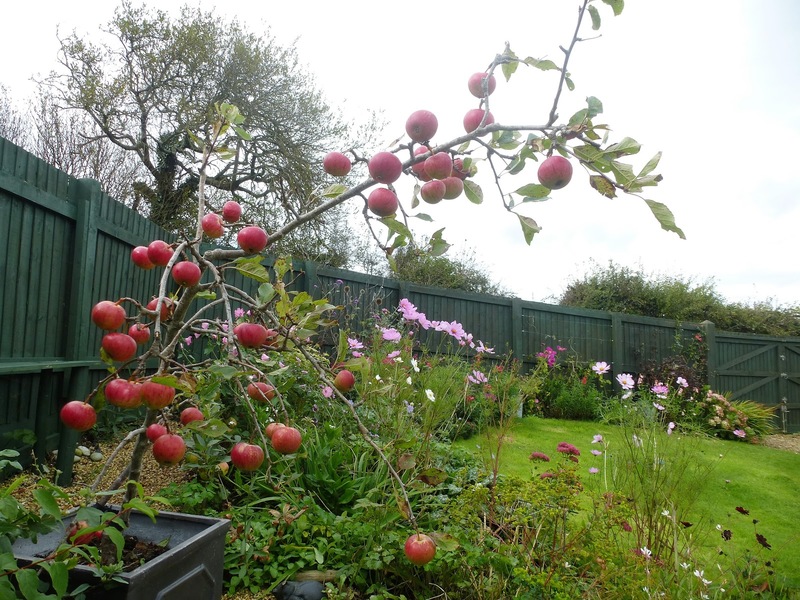 As you can see we have a good crop of apples this year, both the apples grown in the pot and the step over tree have only having been in the garden for two years. 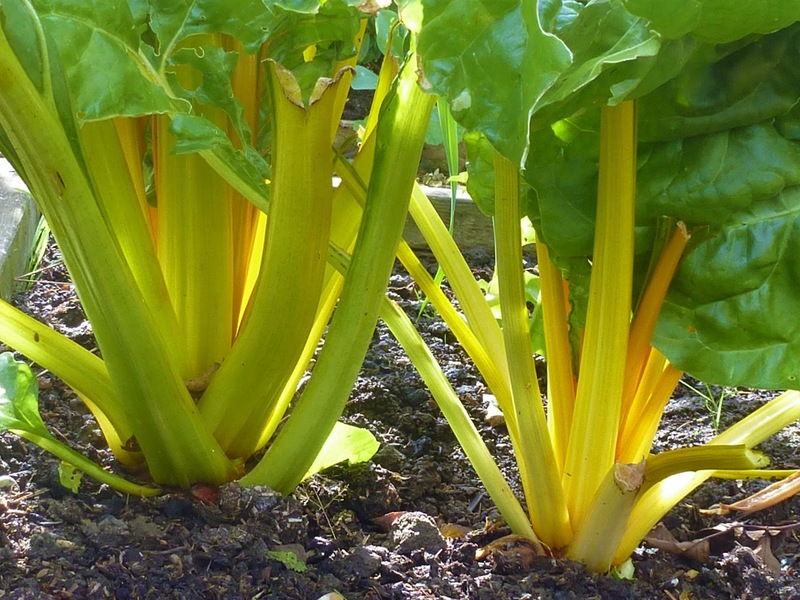 In the vegetable garden the runner beans, tomatoes and cucumber have finished but we still are enjoying this yellow chard, it looks beautiful lit up by the sunshine. Our cat Jackson is enjoying the sunshine too, whereas Tavi is just wanting to get inside ! The usual views of the garden are still dominated by the cosmos which is beginning to go over. What has been happening in your garden in September? If you would like to join in with Through the garden gate each month please let me know in the comments below and I will add your site. 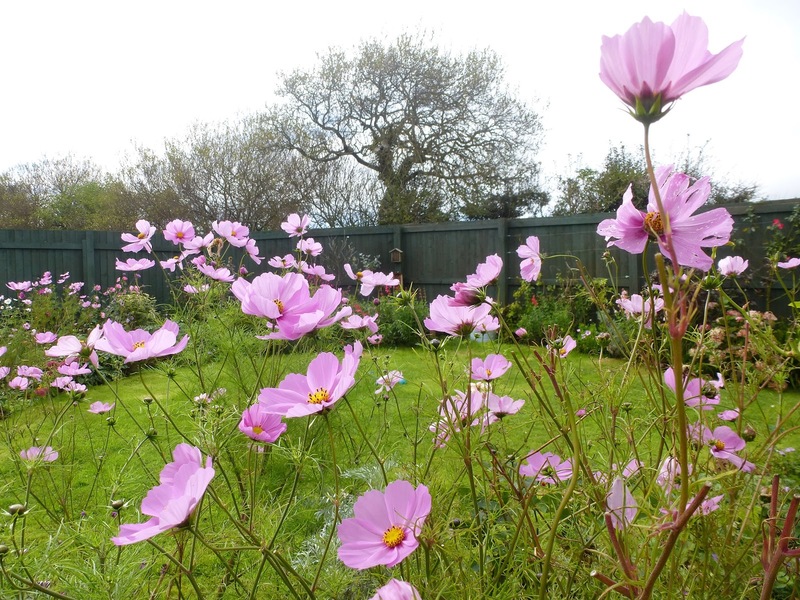 Our garden certainly isn't as pretty as yours with all these delightful flowers. All very beautiful and Jackson and Tavi are adorable. Love the gentle blend of three colours on the clematis. 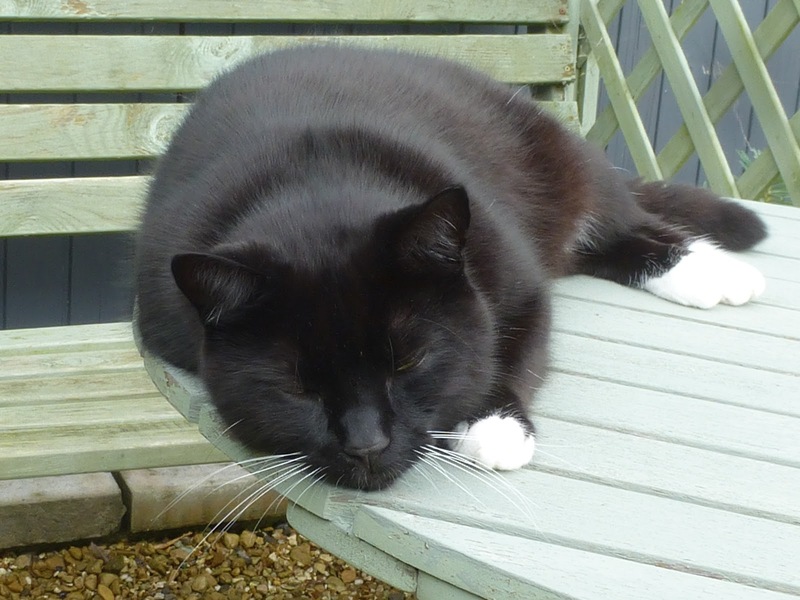 And yon tiggywig enjoying the sun. My goodness, what bounty for this time of year. Looks like summer there instead of fall. Kale, tomatoes and cucumber are abundant still in our garden. Yours is wonderful! Sarah. 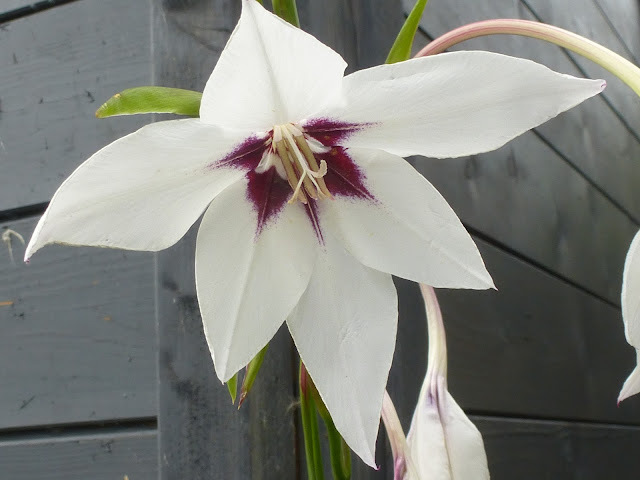 Great garden photos Sarah, I love the flowers, especial the Gladiolus murielae which I also grow in my garden, the fragrance of these flowers is out of this world. Your grapes look so good, looking forward to hear about the wine experience. I just made last week juice of my grapes, as it was a bit too sour to my taste I mixed it with a dash of apple juice, this made it delicious. Nature is absolutely the best. The flowers, the animals, (that Tavi is hilarious) make me so happy. Have a wondrous October, Sarah! Lovely sleepy cat. I love sedums and will be raiding my daughter's garden (our old garden) in the Spring for some plants for our new garden. 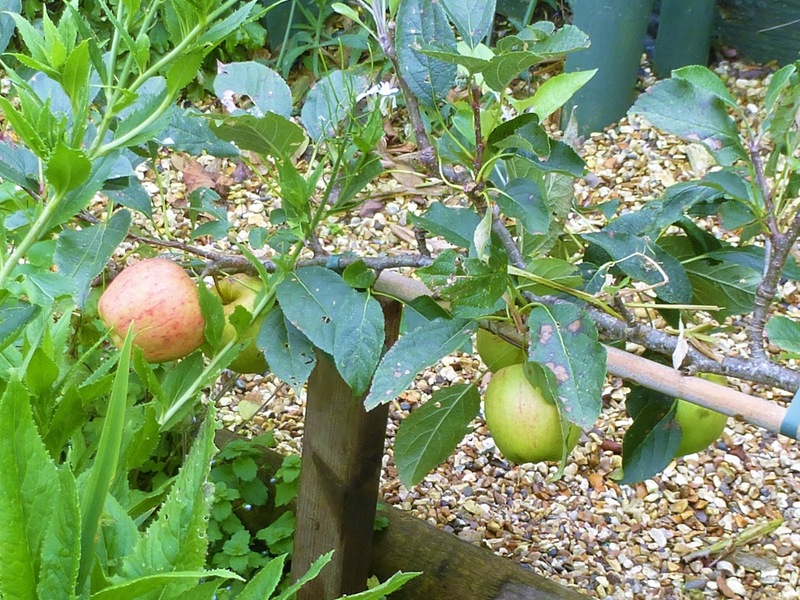 I've managed to do a post this month on our garden, Sarah. Hi Sarah, Jackson looks very happy. I've got a few second flowerings going on and the very last few flowers for bees on lavender in the back garden. Must get some sedum though. Lovely to see visit your garden again those grapes are looking very healthy. What a pretty garden! I'm impressed that you'll make wine. Y'all must have serious skills! Our flowers are looking much better around here, too. I enjoyed seeing little Tavi! He's so sweet! Sarah your garden looks fantastic! 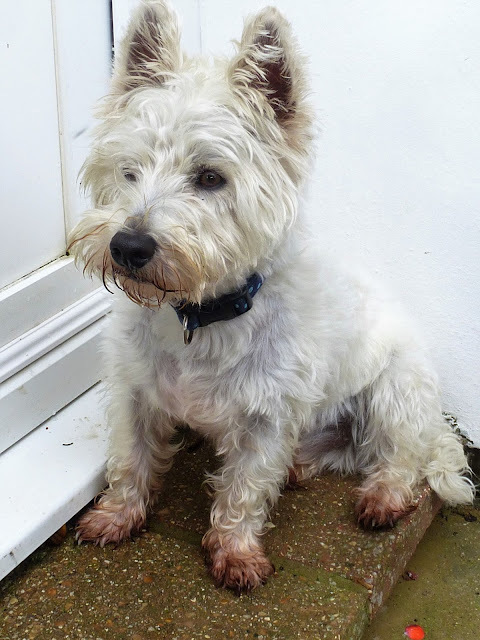 Sadly ours is so wetI can't get any of the autumn work done. Hi Sarah: Hope I'm not too late to join in here! My last post was about the Helianthus in my garden: http://www.libbywilkiedesigns.com/2017/09/friday-flowers-helianthus-love.html We've been having endless heat here which makes it very dry...but oh, the flowers are glorious! Thanks for your lovely post: and that Tavi is just so cute! 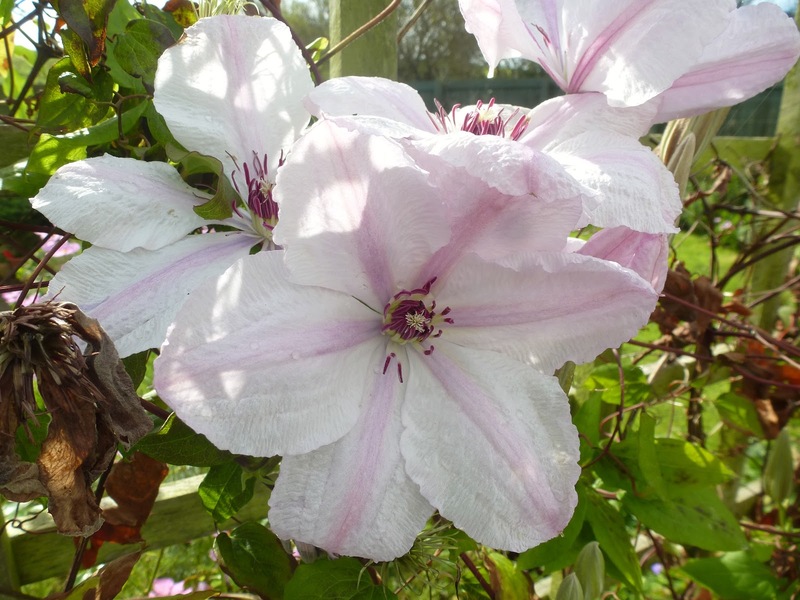 I have just reminded myself to buy clematis for our archway in the front garden, and your clematis looks lovely. 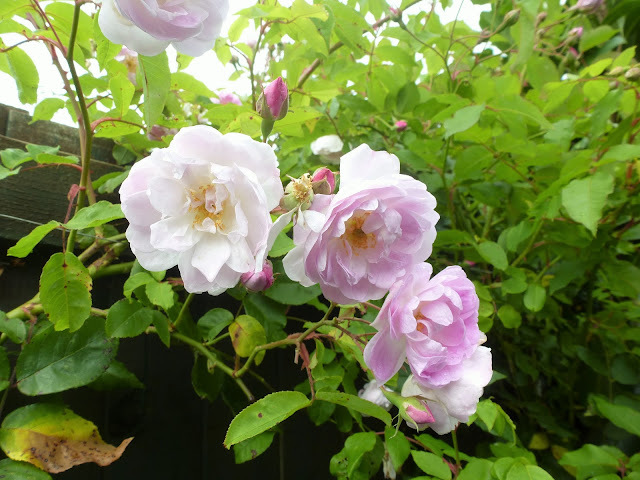 I agree about roses, they often look and smell better when the weather is not so hot. Enjoy your autumn...thank goodness spring has arrived here! Lots of lovely things still in your garden especially those roses. Hope that in a few months time that you will both be able to sit by a roaring winter fire drinking wine from your very own garden. Oh Sarah, I am so envious, especially of the grape vine! Yes, It has been so long. Too long. I can not remember the last time I posted. A lot has gone on, but I do hope that I will keep up my blog. I will need to catch up on your blog. The photos on your resent post are amazing. Thank you so much for visiting mine. Have a wonderful day. It's all looking lovely in your garden, Sarah. I must try growing Gladiolus murielae – I keep seeing it and thinking how lovely it is! Our garden was a fiasco this year. It was a dry Spring and Summer. Water is very expensive to water the garden around here. I love to see all your flowers and vegetables, it all looks so beautiful. You have beautiful pets! Look at your amazing grapes Sarah! They are so impressive!!! I didn't realize apple trees could produce so quickly! And in a pot no less. Your garden looks terrific--those roses! I enjoyed to look through your garden gate in September. It looks still beautiful in autumn. Beautiful, beautiful photos. Your garden looks lovely. Tavi and Jackson are adorable. Good morning, Sarah! We are back. Your garden is looking beautiful, and you have your own wine! 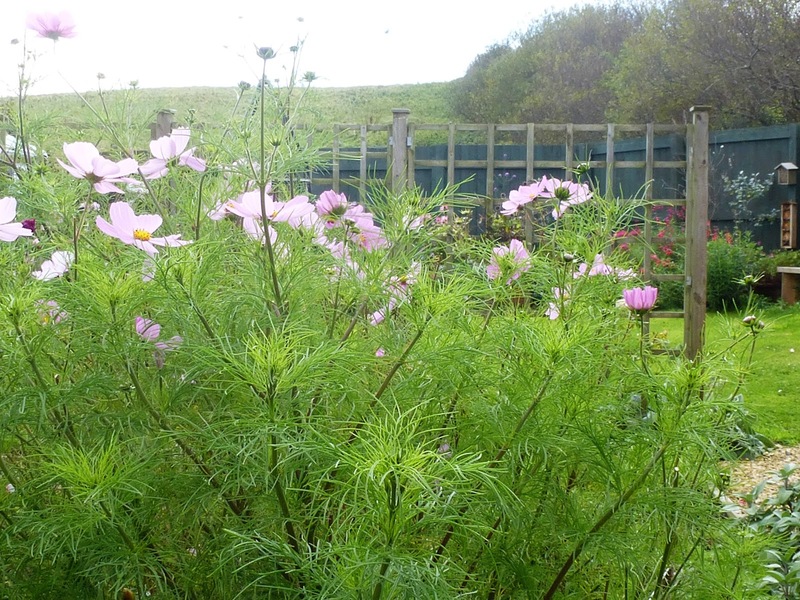 From Sarah Ravens seed I've baught some cosmos. Seed is very expensive. I hope for good flowers. Such a beautiful garden you have and love the pretty roses. Will be nice to drink your own wine from the delicious looking grapes. Tavi and Jackson are so very cute. Bless little Tavi! We don’t have dogs now but when we did they always wanted to get back inside when we were working in the garden. I lost touch with your blog but am very glad to have found it again.